Ex: 4 planes (1 air unit) searching a TF a distance of 5. The chance of detecting naval forces should take the number of ships into account. Large forces are covering a large area and leave a lot of wakes.
? Information on the heading. Shadowing consist of scout air plus staying in the vicinity of an enemy force in order to get a maximum of information and position update on this latter. Shadowing is automatic by default. Air combat could be animated (a bit of work as it is a new type of combat, air-to-air) and/or logged. Should this be visible to player which has lost a scout without sending a radio message ? Fading display depending on the recent position update or not. Say about 3 turns visibles. As today, it will attempt to attack any close and detected force. Otherwise will abort. This is to be defined what can do the AI. It won't take advantage of all the possibiilities for sure. Should it become standard as it has a central effect on the detection ? Still digesting the things but what I want to say is, please slow down the search planes, most CV-based dive-bombers are up to no good even in current scheme in searching. Question: I recall there was a search pattern thing: planes fly around in a circle, or in a S-shape, etc. So technically the search circle is expanding, shrinking, and repeat along the search range till the plane ran out of fuel. right? And does search pattern affects the probability of finding something? Staetment: 1942 Pacific Air War makes killing a shadowing flying boat an air mission. It think it is okay to learn a nasty stalker presence in your backyard. Consideration: must the interceptors sent must be from the TF being shadowed, or is it okay to send planes from another base or other TF? Note: will be shadowing plane endurance be affected, it is not flying at full speed I presume? Statement: I think the ability for the AI to not using all-around search is more important. It looks very promising but we'll have to see how well it works once it's implemented. One feature that I would like to have is that it shows the direction the TF is traveling. This can be represented by a small white arrow on the outer edge of the hex. Just a thought. I need some more time to understand everything and comment. Fully agree with Archerfish, we will have to test and see how the game behaves after this. But again, it sounds really great. Aha, it would be a major improvement for the game, adding much more realism and tactical flexibility. It would be really great to manage planes individually as ships are. Actually you need planes to make anti-sub patrols (and it will come), planes for short and long-range searches, planes for CAPs and finally planes for attack raids... but it is not because there is a major operation going on that you stop the "routine " ones; otherwise you may pay the price for it (typically antisub patrols are vital all the time). BR, please take time and address. Thank you. Have added an image of the Japanese search pattern used at Midway. Someone was mentioning S-shape pattern bu I could not find anything on this. Any link ? If the single plane scale comes out, then that would be a 3.0 ! Honestly, i never saw this kind of search pattern but i am interested if somebody gives any reference. Generally the patterns were like BR described but possibly with some improvements like double searches (with 2 planes instead of 1) or with the search planes taking off before dawn in order to be on their search zone at daylight (but with the inconvenient of not seeing anything on the forward leg). Thank you Bladerunner for your work on this. Brief comment before my iPad looses the ‘net and my post. 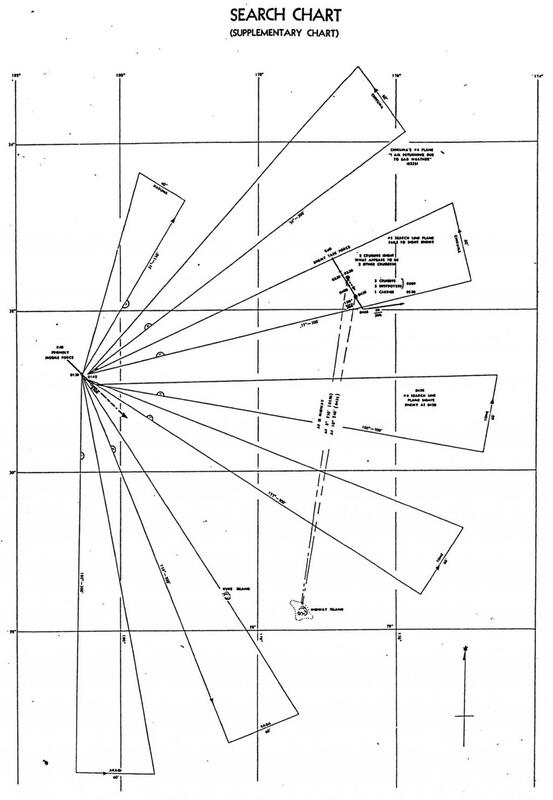 The example is the diagram appears to be the IJN search before Midway. Per Parshall and others it was very poor and left gaps that can be clearly seen. Per Hammel re E Solomons and Santa Cruz, the USN flew SBDs in pairs every 10 degrees out to 200m plus. Much more thorough and we play the USN in CB4G? I can give more examples later. I have considered this problem based on hexes for simple search system for a face to face CV battle at my local games club. It is potentially very complex. My fellow IT gamers/programmers suggested a percentage of success per hex, probably diminishing as the scout flies further out. Controlling individual search planes sounds a nightmare. Send out the scouts and get a result. you are not in favour in detailing too much the search pattern, right ? 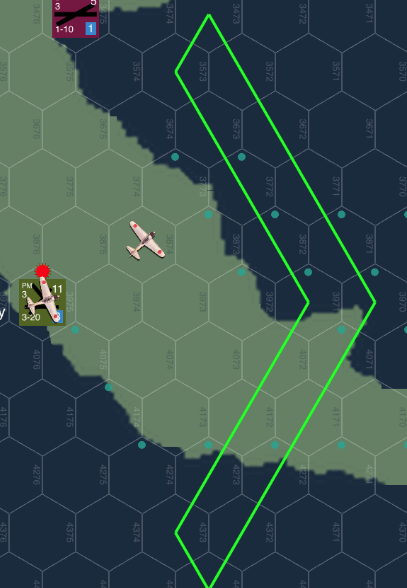 Instead of considering the all area is covered, just consider that a plane with current search range of N may only detect a ship between N-1 and N+1 with fine weather. Instead of drawing coloured arc son the map, one could just have an area formed by the two arcs (N-1 and N+1). Yes, this should be much more realistic since scouts cannot see behind them (well they can see behind them but no more that they can see in front of them or in any other direction). If, for some reason (typically weather) scouts do not see something in an hexe and keep going on along their search path, then they cannot see anything in this hexe unless they come back (typically during the return leg back to base). Seeing one hexe out of the range is not a problem, we know that physically you can see far away from your current position when you are in a plane.